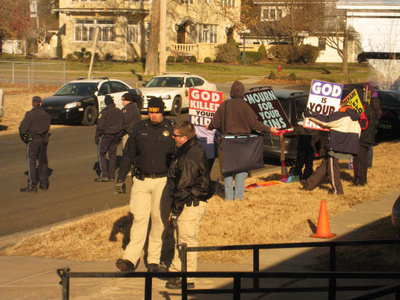 On Sunday, December 19th, 2010, Fred Phelps Westboro Baptist Church picketed our Mulvane Brethren Church in Mulvane, Kansas. It was a cold, blustery morning and we offered the picketers some hot chocolate and cookies. They didn’t accept. They held up protest signs, which read, “Your Pastor is a Whore” (I am the pastor), and “You are Sending Your Children to Hell”, “God Killed Your Kids”, and “God is Your Enemy”. We didn’t engage in conversation, we didn’t respond in-kind to their insults and hate-speech. The local police came out in force to assure that nothing happened. As I viewed the protesters, all I could feel was sorrow for them. I felt compassion for them standing out in the cold and wind holding up signs that were obviously wrong about us. Our message that morning was about how we are loved unconditionally by God and that God separates the sin from the sinner and that He hates sin, but He loves the sinner. Of all the emotions I felt, it was not anger nor did I feel I wanted to argue against their signs that hurled insults at the congregation, but that they are deceived and obviously they don’t know us. 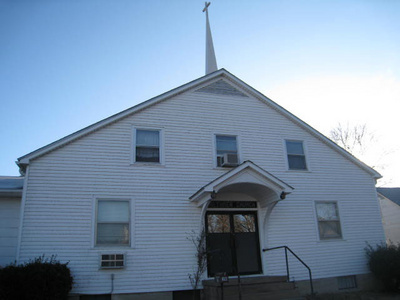 None of the Westboro members had ever met our members or had ever set foot in our church to hear any of the messages. The only reason they were there was because Mulvane, Kansas is the home of the Patriot Guard. The Patriot Guard consists of American veterans, men and women, who ride on their motorcycles and use American flags to block this church’s protesting of veteran funerals. We returned our love to their hate. We offered them hot chocolate and cookies in response to their picketing. We prayed for them in exchange for their damning us to hell. How sad it was to me and brought tears to my heart that they seem to be so far away from God’s unconditional love as can be humanly possible. I have never met a person that God does not want to save. I have never seen a person that God does not want to save. I will never encounter anyone who God does not want to offer them salvation. God loved us while we were still enemies of the cross; He loved us before we even knew Him. He freely gave us eternal life when we did not deserve it. Dear friends and protesters, let us love one another even when others hate us. Why? This is because love comes from God and not from us. Everyone who loves has been born of God and knows God. Whoever does not love does not know God, because God is love so for those who don‘t know God, like those whom may not outside our doors, let us pray for them. Jesus said to pray for those who persecute us and pray for our enemies. We are never more like God when we love the unlovable and do good to them who hate us and despitefully use us or accuse us. And since God so loved us, we also ought to love one another, regardless of their actions against us. Even though none of us have ever seen God; if we love one another, God lives in us and his love is made complete in us. Anyone can claim to love God, but if they hate their brother or sister, then they obviously don’t know God because whoever does not love their brother and sister, whom they have seen, how can they possibly love God, whom they have not seen? And this is what God has commanded believers; whoever loves God would also love their brother and sister. And then I paraphrased in my message from I John 3:10-15, 23-24. Here’s the acid test for who the children of God really are and who are not: Anyone who does not do what is right is not God’s child, nor is anyone who does not love their brother and sister. John refers to his Gospel and says that this is the message you heard from the beginning: That we should love one another. And don’t be surprised, my brothers and sisters, if the world hates you. If the world loved us, then I would be worried that we actually were the children of God. We can know that we went from death to eternal life when we love each other. Sadly, anyone who does not love remains in death. If anyone hates a brother or sister, the Bible says they are a murderer, and you and I know that no murderer has eternal life residing in them. And this is God’s command: To believe in the name of his Son, Jesus Christ, and to love one another as He commanded us. The one who keeps this command of God’s lives in him, and He lives in them. And here is exactly how we know that He lives in us: We know it by the Holy Spirit He gave us. That proves it. I love paraphrasing the Bible in particular situations because it makes scripture come alive. And the Word of God makes alive what was once dead. We were a valley of dry bones, but God gave us life. We offered cookies and hot chocolate to these protesters as an expression of God’s love. Even though they rejected them, they yelled at us, they called us names and condemned us to hell; we understand that they need God’s love. Jesus wants them to come to Him for eternal life because Jesus didn’t come to condemn, so neither should we (John 3:17). Yes, God hates sin, but loves the sinner. We did not return hate to these protesters, but we returned love, and prayers for their eternal salvation. God loves them, and so we did too. Please join us in praying for these deceived individuals that the miracle of the impartation of the Holy Spirit would be shed abroad in their hearts and that they might come to a saving knowledge of Jesus Christ. This is not what Protestant means; to protest against other churches. Oh that they might know the mighty depths and riches of His enduring mercy and grace, of which no man or woman can protest or argue against.